Deutsche Bank, the Trump Organization's largest creditor, said Monday that the Justice Department recently closed a criminal investigation into possible currency manipulation. The Justice Department notified the German bank in a letter Feb. 13 that it was closing the investigation, Deutsche Bank said Monday in a public filing. President Donald Trump's Attorney General Jeff Sessions took office on Feb. 9. In October, near the end of the Obama administration, the Commodity Futures Trading Commission dropped its own investigation into Deutsche Bank and currency manipulation. Deutsche Bank has drawn special scrutiny in recent months because of its ties to Trump, which include billions of dollars of loans since the 1990s. Many of the loans have been paid off but four remain unpaid -- on properties in Miami, Chicago and Washington, D.C. The four loans were worth a total of $364 million when they were made, between 2012 and 2015, and are now worth roughly $300 million, according to an estimate by Bloomberg. The Justice Department would not comment on its decision to close the investigation. Deutsche Bank did not return an email seeking comment. The troubled bank has paid billions of dollars in fines in recent years to settle charges worldwide. 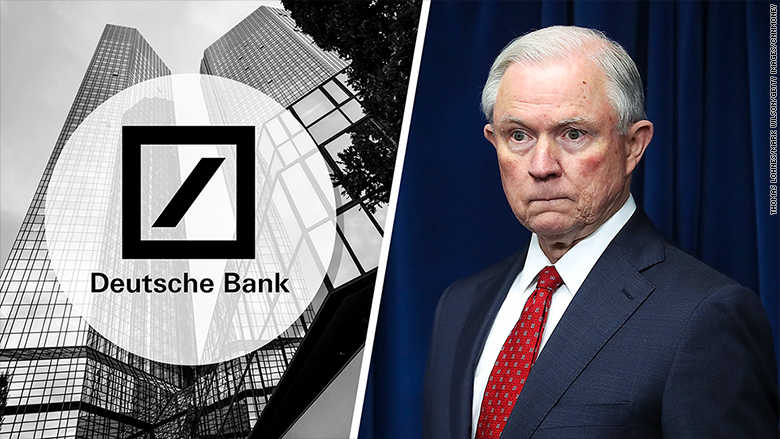 In January, three days before Trump took office, the Justice Department settled a longstanding civil case alleging that Deutsche Bank sold toxic mortgage-backed securities in the years before the market meltdown in 2008. Deutsche Bank paid $7.2 billion. In 2015, the bank paid the Justice Department and international regulators $2.5 billion to settle charges it conspired to manipulate global interest-rate benchmarks. In the Justice Department's currency-manipulation investigation, five major banks pleaded guilty in 2015 and paid a total of $2.5 billion in criminal penalties to settle charges that they manipulated the prices of dollars and euros in the foreign-currency exchange. The banks included Citigroup, JPMorgan and Bank of America. Deutsche Bank said in its filing Monday that other "regulatory and law-enforcement agencies" around the world are probing currency trading and that is it "cooperating with these investigations." The bank did not specify which agencies are investigating but said the probes could result in "significant financial penalties."